Benson and Lee set out to break the Guinness World Record for the largest Lincoln Log structure to mark the two-year anniversary of Sam's death, which is Wednesday. With Purpose, a South Carolina-based organization that Benson launched in 2014 to advance treatments for childhood cancer, hosted the build last weekend at the Belmond Charleston Place hotel. 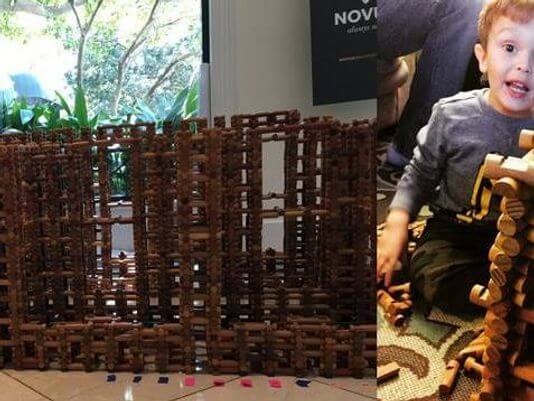 Through 24 hours of building over the course of two days, a team constructed a massive fort using 17,504 logs, according to Benson. They broke the previous Guinness World Record of 17,384, but must submit their evidence to be officially certified as the record-holder, which Benson said takes three to five months. Only one person could build at a time, Benson said. And With Purpose's architectural partner, Novus Architects, had a team of eight that placed most of the logs. Novus Architects was founded 25 years ago by Tommy Smith in his living room working for one client. It didn’t take long to grow as the demand also grew for his creative process and commitment to exceptional customer service. Today, with offices in Atlanta, Asheville, Charleston and Charlotte, Novus has a mission to create highly functional, beautiful spaces that are more than brick and mortar, or fixtures and furniture – spaces that foster human interaction, discovery and deep connection.